It has been suggested that HP Inc. be merged into this article. (Discuss) Proposed since January 2019. The Hewlett-Packard Company (commonly referred to as HP, and stylized as hp) or Hewlett-Packard (/ˈhjuːlɪt ˈpækərd/ HEW-lit PAK-ərd) was an American multinational information technology company headquartered in Palo Alto, California. It developed and provided a wide variety of hardware components as well as software and related services to consumers, small- and medium-sized businesses (SMBs) and large enterprises, including customers in the government, health and education sectors. Bill Hewlett and David Packard graduated with degrees in electrical engineering from Stanford University in 1935. The company originated in a garage in nearby Palo Alto during a fellowship they had with a past professor, Frederick Terman at Stanford during the Great Depression. They considered Terman a mentor in forming Hewlett-Packard. In 1938, Packard and Hewlett begin part-time work in a rented garage with an initial capital investment of US$538. In 1939 Hewlett and Packard decided to formalize their partnership. They tossed a coin to decide whether the company they founded would be called Hewlett-Packard (HP) or Packard-Hewlett. HP incorporated on August 18, 1947, and went public on November 6, 1957. Of the many projects they worked on, their very first financially successful product, was a precision audio oscillator, the Model HP200A. Their innovation was the use of a small incandescent light bulb (known as a "pilot light") as a temperature dependent resistor in a critical portion of the circuit, the negative feedback loop which stabilized the amplitude of the output sinusoidal waveform. This allowed them to sell the Model 200A for $89.40 when competitors were selling less stable oscillators for over $200. The Model 200 series of generators continued production until at least 1972 as the 200AB, still tube-based but improved in design through the years. One of the company's earliest customers was Walt Disney Productions, which bought eight Model 200B oscillators (at $71.50 each) for use in certifying the Fantasound surround sound systems installed in theaters for the movie Fantasia. During the 1960s, HP partnered with Sony and the Yokogawa Electric companies in Japan to develop several high-quality products. The products were not a huge success, as there were high costs in building HP-looking products in Japan. HP and Yokogawa formed a joint venture (Yokogawa-Hewlett-Packard) in 1963 to market HP products in Japan. 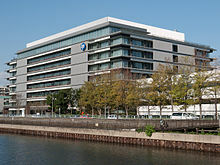 HP bought Yokogawa Electric's share of Hewlett-Packard Japan in 1999. HP spun off a small company, Dynac, to specialize in digital equipment. The name was picked so that the HP logo "hp" could be turned upside down to be a reverse reflect image of the logo "dy" of the new company. Eventually Dynac changed to Dymec, and was folded back into HP in 1959. HP experimented with using Digital Equipment Corporation (DEC) minicomputers with its instruments, but after deciding that it would be easier to build another small design team than deal with DEC, HP entered the computer market in 1966 with the HP 2100 / HP 1000 series of minicomputers. These had a simple accumulator-based design, with two accumulator registers and, in the HP 1000 models, two index registers. The series was produced for 20 years, in spite of several attempts to replace it, and was a forerunner of the HP 9800 and HP 250 series of desktop and business computers. The company earned global respect for a variety of products. 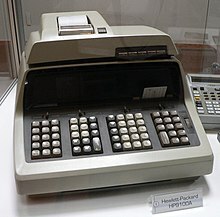 They introduced the world's first handheld scientific electronic calculator in 1972 (the HP-35), the first handheld programmable in 1974 (the HP-65), the first alphanumeric, programmable, expandable in 1979 (the HP-41C), and the first symbolic and graphing calculator, the HP-28C. Like their scientific and business calculators, their oscilloscopes, logic analyzers, and other measurement instruments have a reputation for sturdiness and usability (the latter products are now part of spin-off Agilent's product line, which were later spun off from Agilent as Keysight Technologies). The company's design philosophy in this period was summarized as "design for the guy at the next bench". In 1984, HP introduced both inkjet and laser printers for the desktop. Along with its scanner product line, these have later been developed into successful multifunction products, the most significant being single-unit printer/scanner/copier/fax machines. The print mechanisms in HP's tremendously popular LaserJet line of laser printers depend almost entirely on Canon Inc.'s components (print engines), which in turn use technology developed by Xerox. HP develops the hardware, firmware, and software to convert data into dots for printing. On December 31, 2013, HP revised the number of jobs cut from 29,000 to 34,000 up to October 2014. The current number of jobs cut until the end of 2013 was 24,600. At the end of 2013 the company had 317,500 employees. On May 22, 2014 HP announced it would cut a further 11,000 to 16,000 jobs, in addition to the 34,000 announced in 2013. "We are gradually shaping HP into a more nimble, lower-cost, more customer and partner-centric company that can successfully compete across a rapidly changing IT landscape," CEO Meg Whitman said at the time. 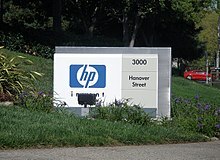 HP produces lines of printers, scanners, digital cameras, calculators, PDAs, servers, workstation computers, and computers for home and small-business use; many of the computers came from the 2002 merger with Compaq. 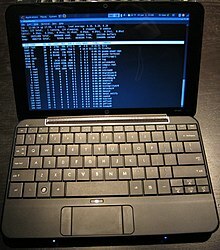 HP as of 2001[update] promotes itself as supplying not just hardware and software, but also a full range of services to design, implement, and support IT infrastructure. HP does especially well for its disclosure of externally verified greenhouse gas emissions and its setting of targets for reducing them. [third-party source needed] However, Greenpeace reports that HP risks a penalty point in future editions due to the fact that it is a member of trade associations that have commented against energy efficiency standards. ^ "HP regains PC lead over Lenovo". PC Pro. January 14, 2013. Retrieved April 27, 2013. ^ "Gartner Says Worldwide PC Shipments Grew 1 Percent in Fourth Quarter of 2014". Gartner. January 12, 2015. Retrieved February 8, 2015. ^ "San Jose Mercury News: "HP's acquisitions cement company's No. 1 status." Chris O'Brien. April 2010". San Jose Mercury News. Retrieved November 30, 2011. ^ "HP Completes Acquisition of 3Com Corporation, Accelerates Converged Infrastructure Strategy". Hewlett-Packard. Retrieved July 7, 2011. ^ Vance, Ashlee; Wortham, Jenna (April 28, 2010). "H.P. to Pay $1.2 billion for Palm". The New York Times. ^ "Dell gives up bidding war for 3Par Inc". Winston-Salem Journal. Associated Press. September 3, 2010. Archived from the original on January 26, 2012. Retrieved September 3, 2010. ^ "Hewlett-Packard to split into two public companies". October 6, 2014. ^ Malone, Michael (2007). Bill & Dave: How Hewlett and Packard Built the World's Greatest Company. Portfolio Hardcover. pp. 39–41. ISBN 1-59184-152-6. ^ "HP Timeline | HP® Official Site". www8.hp.com. 1938-1939. Retrieved 2017-09-30. ^ Mark Hall. "Hewlett-Packard Company". www.britannica.com. Encyclopædia Britannica, Inc. Retrieved March 31, 2018. ^ "HP History : 1960s". Hewlett-Packard. March 17, 1961. Retrieved July 7, 2011. ^ Yokogawa Electric Corporation (July 7, 1999). "Yokogawa Electric Corporation and Hewlett-Packard Company Announce "Hewlett-Packard Japan to become Wholly Owned HP Subsidiary" HP and Yokogawa Sign Agreement". Yokogawa.com. Retrieved July 7, 2011. ^ "Dynac DY-2500 at HP Virtual Museum". Hewlett-Packard. Retrieved July 7, 2011. ^ "HP1000 F-Series". HP Museum. Retrieved July 7, 2011. ^ "Global 500 2009: Global 500 1-100 – FORTUNE on CNNMoney.com". CNN. July 20, 2009. Retrieved May 9, 2010. ^ "Wired 8.12". Wired. Retrieved July 7, 2011. ^ "Apple co-founder offered first computer design to HP 5 times". appleinsider.com. ^ "HP Computer Museum". HP Museum. Retrieved May 9, 2010. ^ Ma'arif, Nelly Nailatie (2008). Power of Marketing. Penerbit Salemba. p. 76. ISBN 9789796914456. ^ "The first ever 20 domain names registered". ComputerWeekly.com. Retrieved 2018-02-12. ^ Arensman, Russ. "Unfinished business: managing one of the biggest spin-offs in corporate history would be a challenge even in the best of times. But what Agilent's Ned Barnholt got was the worst of times. (Cover Story)." Electronic Business 28.10 (October 2002): 36(6). ^ Sellers, Patricia. "The 50 Most Powerful Women in American business". Fortune. Retrieved 2017-07-22. ^ Johnson, Craig. "The Rise and Fall of Carly Fiorina: An Ethical Case Study". George Fox University. ^ Goldman, David (September 21, 2015). "Behind Carly Fiorina's 30,000 HP layoffs". CNNMoney. Archived from the original on September 24, 2015. Retrieved July 22, 2017. ^ Stewart, James (12 February 2007). "Loose Lips at Hewlett-Packard". The New Yorker. ^ Sullivan, Tom. "Fiorina resigns HP CEO post". InfoWorld. Retrieved 2017-07-22. ^ a b c d e "Fiorina's HP Earned Millions From Sales in Iran". Bloomberg. Retrieved September 20, 2015. ^ "Carly Fiorina & H.P. Thwarted U.S. Sanctions, Sold $120 Million In Product To Iran". Headline and Global News. September 16, 2015. Retrieved September 20, 2015. ^ a b Stockman, Farah (December 29, 2008). "HP uses third party to sell printers in Iran Calif. firm's sales soar in embargo". Boston Globe. Retrieved September 20, 2015. ^ "HP Press Release: Hewlett-Packard and Compaq Agree to Merge, Creating $87 billion Global Technology Leader". Hewlett-Packard. Retrieved May 9, 2010. ^ "HP Closes Compaq Merger" (Press release). Hewlett-Packard. Retrieved May 9, 2010. ^ "HP News - HP Launches "Everybody On" Global Marketing Campaign". www8.hp.com. Retrieved April 3, 2017. ^ a b La Monica, Paul. "HP's Hurd mentality". money.cnn.com. CNN Money. Retrieved 2018-02-12. ^ JOURNAL, Pui-Wing Tam Staff Reporter of THE WALL STREET. "H-P's Board Ousts Fiorina as CEO". WSJ. Archived from the original on 2015-01-23. Retrieved 2018-02-12. ^ La Monica, Paul. "Fiorina out, HP stock soars". money.cnn.com. CNN Money. Retrieved 2018-02-12. ^ Larcker, David; Tayan, Brian (11 October 2011). "Leadership Challenges at Hewlett-Packard: Through the Looking Glass" (PDF). www.gsb.stanford.edu. ^ "HP: 'Taking Care of Business' to Get More - InternetNews". www.internetnews.com. Retrieved 2018-03-01. ^ "Forget market share, Opteron is a market cap maker". Retrieved 2018-03-01. ^ "HP Buying Opsware in $1.6 Billion Deal". PCWorld. Retrieved 2018-03-01. ^ "Mark Hurd has earned a name at Hewlett-Packard". SFGate. Retrieved 2018-03-01. ^ "press release". Hewlett-Packard. Retrieved July 7, 2011. ^ "HP Announces Expiration of Waiting Period Under HSR Act" (Press release). Hewlett-Packard. Retrieved July 7, 2011. ^ "HP Announces Plans to Integrate EDS". Hewlett-Packard. Retrieved September 18, 2015. ^ "Annual Report 2008". Hewlett-Packard. p. 131. Retrieved September 18, 2015. ^ "HP to Acquire 3Com for $2.7 billion" (Press release). Hewlett-Packard. Archived from the original on March 13, 2011. Retrieved May 9, 2010. ^ "HP to Acquire Palm for $1.2 billion" (Press release). Hewlett-Packard. Retrieved May 18, 2017. ^ VentureBeat, Dean Takahashi. "HP Closes deal on $1.2B acquisition of Palm." July 1, 2010. ^ Cliff Edwards and Aaron Ricadela, businessweek. "HP's Plan to Make TouchPad a Hit." June 23, 2011. Retrieved June 24, 2011. ^ "Oracle hires former HP CEO Hurd as president". CNET. 2010-09-06. Retrieved 2018-03-01. ^ a b Ben Worthen And Joann S. Lublin (August 8, 2010). "Hurd Neglected To Follow H-P Code". The Wall Street Journal. ^ a b "Mark Hurd Ouster: Why HP Had to Force CEO's Resignation". Time. August 10, 2010. ^ "Here's The Real Reason HP CEO Mark Hurd Was Fired (As Best We Can Tell ...)". Business Insider. August 10, 2010. ^ Vance, Ashlee; Richtel, Matt (August 9, 2010). "H.P. Followed a P.R. Specialist's Advice in the Hurd Case". The New York Times. ^ Indiviglio, Daniel. "Does Hurd's New Oracle Gig Prove Business Ethics Don't Matter?". The Atlantic. Retrieved 2018-03-01. ^ "One Hundred Top Employees Who Left Hewlett-Packard Since 2010". Bloomberg. January 11, 2013. Retrieved January 18, 2013. ^ Vance, Ashlee (August 9, 2010). "Oracle Chief Faults H.P. Board for Forcing Hurd's Resignation". The New York Times. ^ "Léo Apotheker Named CEO and President of HP". Hewlett-Packard. Retrieved July 7, 2011. ^ "Larry Ellison outraged as HP hands top job to ex -SAP CEO". ComputerworldUK.com. Retrieved July 7, 2011. ^ "SAP accepts some liability in Oracle lawsuit". ComputerworldUK.com. Retrieved July 7, 2011. ^ "P Reports Third Quarter 2011 Results and Initiates Company Transformation". HP.com. Retrieved August 18, 2011. ^ Iwatani, Yukari (August 19, 2011). "Pioneering Firm Bows to 'Post-PC World'". The Wall Street Journal. Retrieved November 30, 2011. ^ "In nod to IBM, HP overhaul minimizes consumers". August 18, 2011. ^ a b c Why Hewlett-Packard's Impulse Buy Didn't Pay Off, Bloomberg BusinessWeek November 29, 2012: "Apotheker believed that HP's platform was sinking ... [and] appeared to be in a hurry to transform the company ... 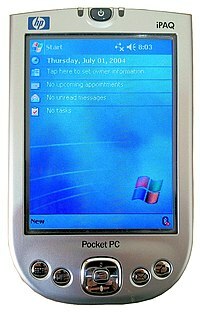 In a rapid series of moves announced in August 2011, Apotheker killed HP's six-week-old TouchPad tablet, explored plans for a spin-out of its PC business, and championed the $10.3 billion acquisition of Autonomy. One former HP executive who worked there at the time says it appeared that Apotheker and the board didn't know what to do, and were trying anything they could think of. It wasn't a strategy, he says. It was chaos ... Oracle CEO Larry Ellison called Autonomy's asking price 'absurdly high'." ^ "HPQ stock since naming Leo Apotheker CEO". ^ a b HP closes Autonomy deal, Reuters, November 3, 2011: "Hewlett-Packard completed its $12 billion buy of British software firm Autonomy on Monday, the centerpiece of a botched strategy shift that cost ex-chief executive Leo Apotheker his job last month. HP said its 25.50 pounds-per-share cash offer – representing a 79 percent premium that many HP shareholders found excessive – had been accepted by investors." ^ "HP names Meg Whitman as CEO". ^ "HP to Keep PC Division". October 27, 2011. ^ Brandon Bailey (March 22, 2012). "HP to combine PC, printing units". San Jose Mercury News. Archived from the original on March 27, 2012. Retrieved March 22, 2012. ^ Poornima Gupta (May 23, 2012). "Analysts back Hewlett-Packard's layoff plans". Reuters. Retrieved May 23, 2012. ^ "HP announces 27,000 job cuts". The Times of India. Archived from the original on May 25, 2012. Retrieved March 30, 2018. ^ "PC-maker HP unveils its first net-zero energy data centre". The Times of India. May 31, 2012. ^ "Zero-Day Vulnerability Found in The Server Monitoring Software of HP". Retrieved July 10, 2012. ^ "HP Support document". Retrieved July 10, 2012. ^ "HP Training Center Official Website Hacked & Defaced". Retrieved August 12, 2012. ^ "HP revises restructuring figures; now cutting 29,000 jobs". ZDNet. Retrieved September 10, 2012. ^ "HP woes continue as 5,000 more employees face the axe". Retrieved December 31, 2013. ^ Hardy, Quentin; Gelles, David (October 5, 2014). "Hewlett-Packard Is Said to Be Planning a Split of Businesses". The New York Times. Retrieved October 6, 2014. ^ "HP Confirms Higher Layoffs Expected". NBC Bay Area. December 31, 2013. ^ "Nearly 16,000 jobs are set to go at Hewlett-Packard". Big News Network. Retrieved May 23, 2014. ^ Morgan, Timothy Prickett (June 12, 2014). "HP Puts Memristors At The Heart Of A New Machine". EnterpriseTech. Retrieved December 14, 2014. ^ Koch, Wendy (October 5, 2014). "Hewlett-Packard plans to break into two". USA Today. Retrieved October 6, 2014. ^ "Hewlett-Packard to Split Into Two Companies: Report". NBC News. Retrieved October 6, 2014. ^ "HP To Separate Into Two New Industry-Leading Public Companies" (Press release). 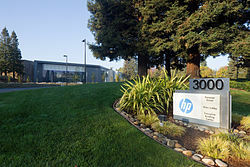 Palo Alto, California: Hewlett-Packard. October 6, 2014. Retrieved October 6, 2014. ^ Baig, Edward C. (October 29, 2014). "First Look: HP pushes into 3-D printing, Blended Reality". USA Today. ^ Yimou Lee (May 21, 2015). "HP sells $2.3 billion China unit stake to forge partnership with Tsinghua Unigroup". Reuters. Retrieved May 26, 2015. ^ Darrow, Barb (October 30, 2015). "Bye-bye HP, it's the end of an era". Fortune Magazine. ^ "HP Online privacy statement". Welcome.hp.com. Retrieved July 7, 2011. ^ "HP Office locations". Hewlett-Packard. Retrieved July 7, 2011. ^ a b "HP Worldwide Sales and Services Directory" (PDF). Welcome.hp.com. Retrieved October 7, 2012. ^ "Plan de commune Archived July 6, 2011, at the Wayback Machine." Meyrin. Retrieved September 29, 2009. ^ "HP Online privacy statement". Welcome.hp.com. Retrieved May 9, 2010. ^ "HP Office locations". Hewlett-Packard. Retrieved May 9, 2010. ^ ""San Jose Mercury News: HP's acquisitions cement company's No. 1 status". Chris O'Brien. April 2010". San Jose Mercury News. Retrieved November 30, 2011. ^ a b c "Hewlett-Packard Co. : Form 10-K" (PDF). Hewlett-Packard. Retrieved October 7, 2012. ^ The HP iPrint Photo. Hp.com. Retrieved July 26, 2013. ^ "HP Press release archives". Hewlett-Packard. Retrieved July 7, 2011. ^ "HP Executive Team Bios: Shane Robison". Hewlett-Packard. Retrieved July 7, 2011. ^ "HP newsletter examines how ProCurve model fits". Archived from the original on March 20, 2007. Retrieved July 4, 2014. ^ "Title of backgrounder" (PDF). Retrieved July 7, 2011. ^ Wilcox, Joe (December 14, 2006). "HP-MS support deal". Microsoft-watch.com. Archived from the original on September 13, 2012. Retrieved July 7, 2011. ^ "Hewlett-Packard Alumni "HP Way" page". Hpalumni.org. October 19, 2000. Retrieved July 7, 2011. ^ "The HP Way – Hewlett-Packard Alumni". Hpalumni.org. October 19, 2000. Retrieved May 9, 2010. ^ "HP Press Release: Hewlett-Packard Announces Departure of Michael D. Capellas". Hp.com. Retrieved November 30, 2011. ^ hpandwoz (April 23, 2010). "Steve Wozniak Talks About HP". YouTube. Retrieved November 30, 2011. ^ a b c "Hewlett Packard Enterprise just won $3 billion in a lawsuit against Oracle". Retrieved August 13, 2016. ^ "HP Meets Billion Pound Recycling Goal Six Months Early, Sets Target for 2 billion Pounds by 2010". My Solution Info. Retrieved July 16, 2007. ^ "Official HP Global Citizenship report 2009" (PDF). Retrieved July 7, 2011. ^ "HP Steps Up IT Industry Transparency, Releases Supply Chain Emissions Data". Retrieved October 21, 2009. ^ "Hewlett-Packard – Green Rating". Newsweek. Newsweek, Inc. Archived from the original on September 24, 2009. Retrieved September 22, 2009. ^ "HP, Dell, J&J, Intel and IBM Top Newsweek's Inaugural Green Rankings". Retrieved September 22, 2009. ^ "CR's 100 Best Corporate Citizens 2010". theCRO.com. CRO Corp. Retrieved June 1, 2010. ^ Coster, Helen (March 3, 2010). "The 100 Best Corporate Citizens". Forbes. Retrieved March 3, 2010. ^ "World's Most Admired Companies 2010: Hewlett-Packard snapshot". FORTUNE on CNNMoney.com. March 22, 2010. Retrieved June 1, 2010. ^ "HP official corporate responsibility report 2010". Hewlett-Packard. Retrieved July 7, 2011. ^ "Corporate Register News Release: "CR Reporting Awards Global Winners and Reporting Trends report released." March 24, 2011" (PDF). Retrieved July 7, 2011. ^ "HP Global Citizenship Report for 2009" (PDF). Retrieved July 7, 2011. ^ Ross, Andrew S. (April 16, 2010). "State firms praised for purging toxic chemicals". San Francisco Chronicle. ^ "2010 World's Most Ethical Companies Archived April 19, 2010, at the Wayback Machine. Retrieved March 3, 2010. ^ a b "Guide to Greener Electronics". Greenpeace International. Retrieved November 12, 2011. ^ "Guide to Greener Electronics". Greenpeace International. ^ "HP Global Citizenship: Product Manufacturing". Hewlett-Packard. Retrieved November 14, 2011. ^ Tsukayama, Hayley (March 15, 2011). ""Q&A with HP's Scott Taylor: Setting an industry privacy framework." Hayley Tsukayama. March 15, 2011". The Washington Post. Retrieved July 7, 2011. ^ "Ponemon Survey Names Twenty Most Trusted Companies for Privacy" (Press release). Traverse City, MI: Ponemon Institute. February 26, 2010. Retrieved July 7, 2011. ^ "FTC Second Roundtable Consumer Privacy. January 28, 2010". SafeInternet.org. Archived from the original on June 2, 2011. Retrieved July 7, 2011. ^ "U.S. Federal Trade Commission Staff Report:"Protecting Consumer Privacy in an Era of Rapid change." Dec. 2010" (PDF). Retrieved July 7, 2011. ^ "International Business Times: "2011 Most Respected Companies in China" Zoe Chan. April 23, 2011". International Business Times. April 23, 2011. Archived from the original on April 27, 2011. Retrieved July 7, 2011. ^ Lezhnev, Sasha; Hellmuth, Alex (August 2012). "Taking Conflict Out of Consumer Gadgets: Company Rankings on Conflict Minerals 2012" (PDF). Enough Project. Retrieved August 17, 2012. ^ "100 Best Global Brands" Archived June 25, 2012, at the Wayback Machine. Bloomberg BusinessWeek. Retrieved September 16, 2011. ^ "Drawing in the audience". Hewlett-Packard. Retrieved April 23, 2011. ^ "GSM Insider Is The Latest Shirt Sponsorship Of Tottenham Hotspur". Hewlett-Packard. Retrieved July 9, 2013. ^ "Hewlett Packard sponsors Renault". GPUpdate.net. Retrieved 2017-05-04. ^ "Confirmed: Goodbye, HP Pavilion. Hello, SAP Center". Silicon Valley Business Journal. June 5, 2013. Retrieved June 5, 2013. ^ "HP United States – Computers, Laptops, Servers, Printers & more". Hewlett-Packard. Retrieved July 7, 2011. ^ "Large Enterprise Business IT products, services, and solutions". Hewlett-Packard. Retrieved July 7, 2011. ^ "Hewlett-Packard Restates Cash Flow But Not Earnins". The New York Times. March 13, 2003. ^ David Kaplan. "Suspicions and Spies in Silicon Valley". Newsweek Business. Retrieved July 22, 2013. ^ "FAQ: The HP 'pretexting' scandal". ZDNet. ^ Kawamoto, Dawn. 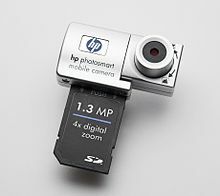 "HP outlines long-term strategy |CNET News.com". CNET. Archived from the original on May 6, 2016. Retrieved July 7, 2011. ^ Katz, Leslie (March 31, 2007). "Calif. court drops charges against Dunn". CNET. Retrieved July 7, 2011. ^ "HP Limited Warranty Service Enhancement – HP Customer Care (United States – English)". H10025.www1.hp.com. Archived from the original on September 1, 2010. Retrieved May 9, 2010. ^ "All Nvidia G84 and G86s are bad". The Inquirer. Retrieved May 9, 2010. ^ NVIDIA. "NVIDIA 2009 Business Update". NVIDIA. Retrieved December 28, 2012. ^ "HP Limited Warranty Service Enhancement (Product Numbers Included) – HP Customer Care (United States – English)". 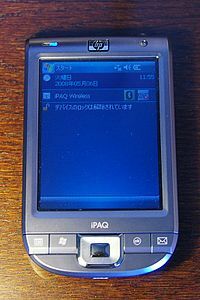 H10025.www1.hp.com. Archived from the original on August 10, 2010. Retrieved May 9, 2010. ^ "Nvidia Defect". Retrieved December 28, 2012. ^ "What to Do If You Are Offered a Repair". Nvidia Defect Forum. Retrieved December 28, 2012. ^ Crothers, Brooke. "HP: Nvidia graphics defect an issue since November 2007". CNET. Retrieved December 28, 2012. ^ "Nvidia Settlement". October 10, 2010. Archived from the original on October 1, 2010. Retrieved January 2, 2012. ^ "Justia docket information Kent v. Hewlett-Packard Company". Justia. Retrieved October 28, 2010. ^ Jack Clark, ZDNet UK. "HP unleashes lawyers on Oracle over Itanium support." June 16, 2011. Retrieved June 17, 2011. ^ Poornima Gupta and Dan Levine, Reuters. "UPDATE 2-HP's latest lawsuit heightens rivalry with Oracle." June 15, 2011. Retrieved June 17, 2011. ^ Gallagher, Sean (August 1, 2012). "HP wins judgment in Itanium suit against Oracle". Ars Technica. Retrieved July 1, 2016. ^ Bright, Peter (June 30, 2016). "HP awarded $3B in damages from Oracle over Itanium database cancelation". Ars Technica. Retrieved July 1, 2016. ^ James Rogers (November 24, 2012). "HP's Autonomy Hassles". TheStreet. Tech. Retrieved January 22, 2013. ^ "Autonomy misled HP about finances, Hewlett-Packard says". BBC News. November 21, 2012. Retrieved January 22, 2013. ^ Jeremy C. Owens (November 23, 2012). "Investors go Black Friday shopping too, sending HP and other struggling tech stocks higher". San Jose Mercury News. Retrieved January 22, 2013. ^ "U.S. judge casts doubt on HP-shareholder settlement in Autonomy lawsuit". Reuters. August 25, 2014. ^ "Latest News Headlines". NASDAQ.com. ^ "Autonomy HP sale investigation by Serious Fraud Office closes". BBC News. January 19, 2015. ^ "Hewlett-Packard to Pay $100 Million to Settle Suit Over Autonomy Purchase". TheStreet. June 9, 2015. Retrieved June 9, 2015. ^ "UN Expert Calls for Boycott of International Businesses Profiting from Israeli Settlements in Occupied Palestinian Territories, in Third Committee" (Press release). United Nations. Retrieved October 16, 2015. ^ "UN independent expert calls for boycott of businesses profiting from Israeli settlements". United Nations. October 25, 2012. ^ "Presbyterian Church votes to divest in protest of Israeli policies". NY Times. June 20, 2014. ^ "City of Portland Human Rights Commission Endorses Occupation-Free Portland's Proposed Statement to the Socially Responsive Investments Committee". City of Portland Website. October 29, 2015. ^ "HP Pays $108 Million To Settle Bribery Cases". ^ "SEC.gov - SEC Charges Hewlett-Packard With FCPA Violations". sec.gov. ^ "HP Pays $108M To Settle Bribery Cases". Business Insider. April 9, 2014. ^ Jennifer Booton. "H-P Pays $108M to DOJ, SEC Over Anti-Bribery Allegations". Fox Business.